We've been following a large, and growing Lassa fever outbreak in West Africa - first in Nigeria, then in Benin, and most recently Togo - since early January (see Nigeria: Lassa Fever Outbreak With 40 Fatalities). Just last week we learned of the air evacuation of an American from Togo (see Emory University Hospital To Admit A Suspected Lassa Fever Patient). NCDC's latest report, dated 14 March 2016, the total number of reported cases is 254 (129 of which confirmed by lab tests) and the total number of deaths (suspected, probable and confirmed) is 137, with a Case Fatality Rate (CFR) of 53.9%. Remarkable because last year (2015), Nigeria reported 250 cases (likely a substantial under count) and only 8 deaths. Normally, 80% who are infected only experience mild symptoms, and the overall mortality rate is believed to be in the 1% to 2% range (although it runs higher (15%-20%) among those sick enough to be hospitalized). The Lassa virus is commonly carried by multimammate rats, a local rodent that often likes to enter human dwellings. Exposure is typically through the urine or dried feces of infected rodents, although human-to-human transmission is possible. Over the years we've seen a number of imported cases of Lassa fever to Europe, and into the United States (see here and here). Despite the potential for H-2-H transmission, we've never seen a cluster of cases outside of Africa. About 10 days ago the medical director of a missionary hospital in Togo, who had been transferred to a hospital in Cologne, Germany, died of Lassa fever. Yesterday German authorities announced that three contacts of his - including the mortician who prepared his body - have been diagnosed with Lassa. Making this, according to experts at Germany's Robert Koch Institute, the first documented outbreak of Lassa fever virus outside of Africa. Meanwhile, Lassavirus infections have been diagnosed with three contact persons of the Lassa fever patients late end of February 2016 at the Cologne University Hospital. All were under observation. 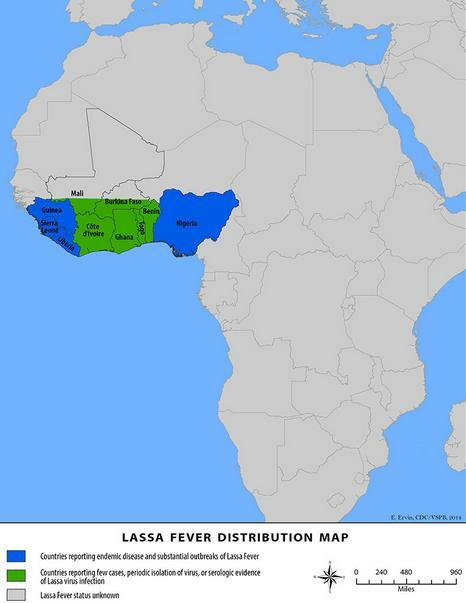 The Lassa fever deceased worked for an aid organization in Togo and had infected there. Now suffering from Lassa fever and be regarded as secondary cases patients had contact with the patient's body during the period from late February to early March 2016. They are currently in isolation units in Düsseldorf and Frankfurt. All three involved a blood test carried out on the basis of an incipient symptoms on 15 and 17 March, respectively resulted in the diagnosis of Lassavirus infection. On the isolation units, patients can be optimally and without risk for the attending medical personnel, supplies and medication. The contact persons of the three patients are watched closely. Although in Africa especially in the context of medical nursing quite human-to human transfers by Lassa fever, the transfers occurred in Germany are unusual. The circumstances of the transfers are currently investigating. In previous cases no secondary diseases were known among the many contact persons in cases of Lassa fever treated outside of Africa, even though had been to some late diagnosed as Lassa fever cases and therefore also not always consistently adhered to appropriate protective measures. However a remaining asymptomatic probable infection was documented in Germany already even retrospectively. Other contact persons of the deceased patients in Togo, the maximum incubation period of Lassa fever (21 days) expires after their last contact with the patient in the next few days. They are under observation and would promptly recorded in an isolation ward at the onset of disease symptoms. A risk of infection for the population is currently of no contact person. Lassavirus infected can transmit only the infection with the entry of disease symptoms on others. Details are available in the RKI Guide for doctors to routes of infection, symptoms, and diagnosis of Lassa fever. In contrast to the patient flown from Togo who was already seriously ill upon his arrival in Cologne, the patients now in Germany supplied early best medically. The proportion of deadly curves is significantly lower than about when Ebola fever at Lassa fever. I think Google Translate has let you down. The RKI article says that of the three contacts thought to have Lassa virus, in two cases that has now been confirmed not to be the case. Still there remains one case of secondary Lassa, which in itself is unusual although not unheard of. Three contacts of the Lassa fever patient who died at the end of February 2016 at the Cologne University Hospital have been diagnosed with the disease. All are under observation," the institute added. Later, on Saturday, Heinrich Heine University in Dusseldorf said it had withdrawn the positive diagnosos for two patients because the Lassa results could not be confirmed. But it said they remained under observation and were still suspected of having Lassa.